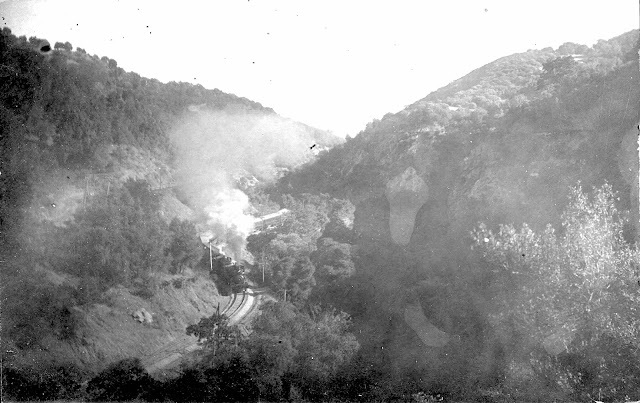 There were many scenic and picturesque locales along the South Pacific Coast Railroad's route to Santa Cruz, and one of the most heavily photographed was Cats Canyon. Cats Canyon is a roughly 1.5-mile gorge that runs from just south of Los Gatos—the present location of "The Cats" figurine—to the modern-day James J. Lenihan Dam, where once sat the confluence of Limekiln Creek and Trout Creek into Los Gatos Creek. It is named after the wildcats—bobcats and cougars—that once roamed the area. A path through Cats Canyon has always been available to those who seek it. The native Ohlone people maintained at least one seasonal trail through the gorge for thousands of years before a Westerner laid eyes on the canyon. During the Spanish and Mexican colonial periods, a crude trail down Los Gatos Creek, probably following the old Ohlone route, was used infrequently by bureaucrats, friars, soldiers, and other travelers. Over the years, portions of this route fell into American hands. One of the earliest such roads was Zachary "Buffalo" Jones's so-called Farnham's Toll Road, which ran through the lumberman's property through the upper Los Gatos Creek basin. This was in all likelihood the old Ohlone trail with minor improvements. 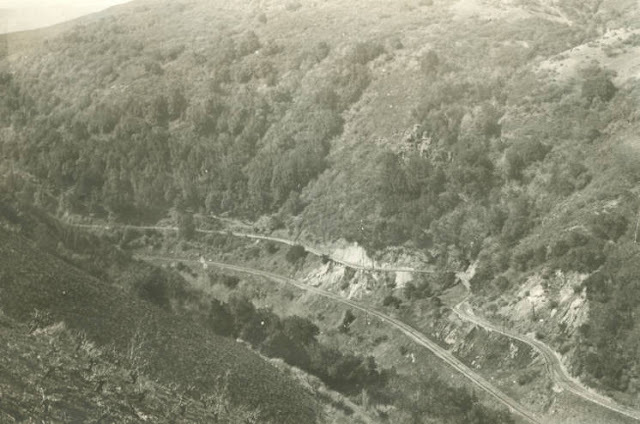 In 1857, Santa Cruz Gap Turnpike Company purchased the line and widened it so it could properly hook up with Charles "Mountain Charlie" McKiernan's toll road that led from the Summit to Santa Cruz via Scotts Valley. The organisation charged passersby tolls for twenty years until their contract expired in 1877. 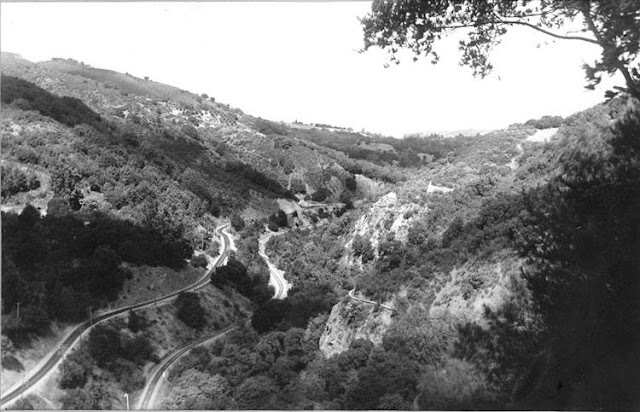 Over the years, the road was progressively widened to support increased traffic to Lexington and the various lumber enterprises situated in the upper Los Gatos Creek basin. 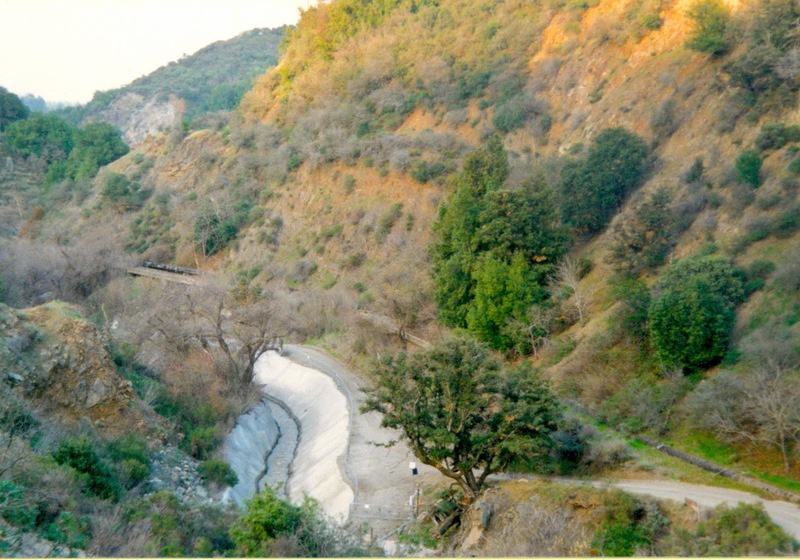 In 1871, the San José Water Company began constructing a wooden box flume above the terraces of Cats Canyon to bring water to San José from Jones's dam south of Forest House (Alma). The original flume was three miles long and remained in place until the 1930s, when it was replaced with an aqueduct. When the South Pacific Coast Railroad first began building south of Los Gatos, it attempted to follow an eastern approach into Cats Canyon, but deposits of blue clay destabilised the grade forcing the railroad to move to the west side of Los Gatos Creek. Throughout 1877, railroad crews graded through the canyon, building two tunnels (one of which collapsed shortly afterwards) in the process. 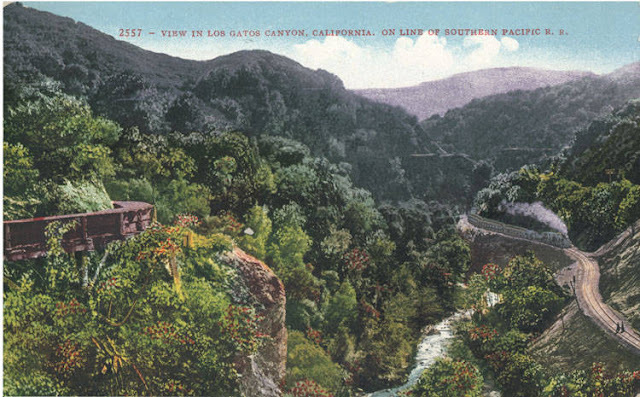 Immediately, Cats Canyon became one of the scenic beauties of the rail line and photographs began appearing in South Pacific Coast marketing. The straight, even tracks running left toward Lexington, while the road to Santa Cruz above meanders around the curves. 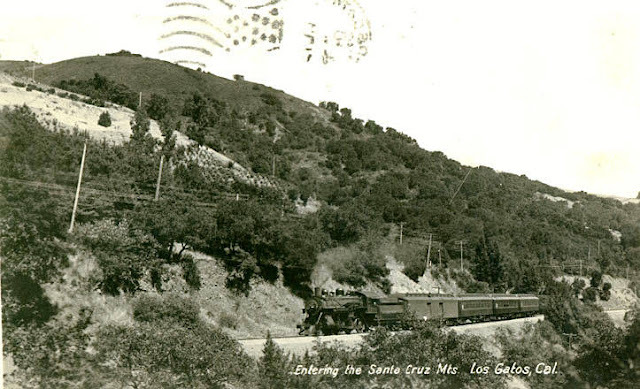 Even after through traffic to Santa Cruz opened up in May 1880, Cats Canyon remained a heavily photographed venue. Indeed, all tourist trains that ran along the South Pacific Coast and, later, Southern Pacific line to Santa Cruz went through the gorge and many stopped within the Los Gatos Creek basin for picnics and frivolities. Although the canyon itself never had any picnic stops or even any sidings, due to its narrow width, the simple passage through the gorge was a sight to behold. 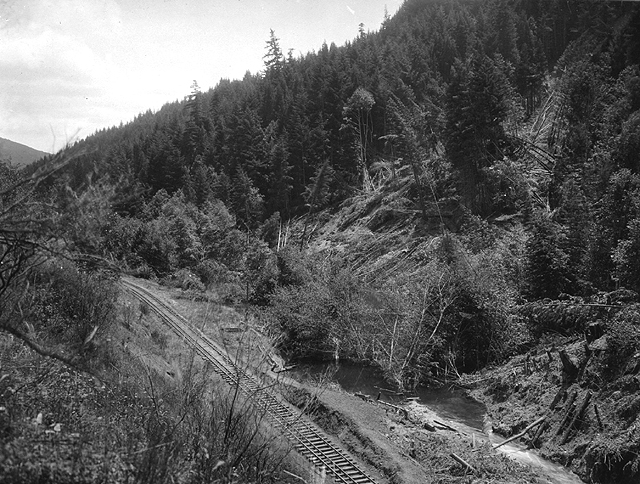 When the Glenwood Highway was completed in 1921, automotive travellers would often stop at two turnouts above the railroad grade and snap photographs of the gorge, complete with the Southern Pacific tracks in the foreground. Some eagle-eyed photographers even managed to include the first Los Gatos Creek trestle in their photographs. Interest in the canyon only declined in the 1930s when passenger service across all Southern Pacific lines was declining. 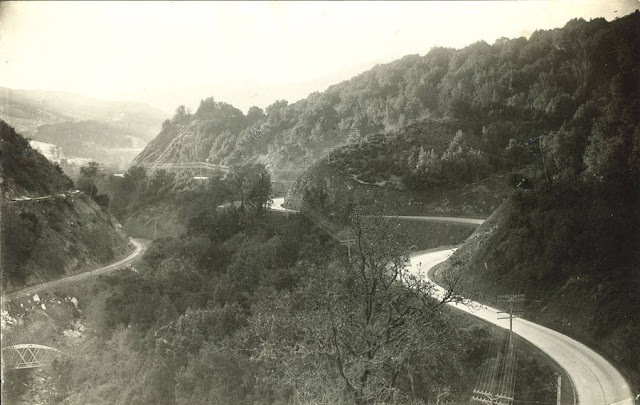 As one of the many projects begun during the Great Depression, the upgrading of the Glenwood Highway to California State Route 17 in 1940 marked the end of Cats Canyon's days as a photo stop. Newer cars could travel at faster speeds and fewer stopped at the two pullouts along the top of the gorge. The completion of Lexington Reservoir in 1952 ended any lingering romantic thoughts of the canyon. Today, many hikers and bicyclists run along the former railroad grade beneath Highway 17, unaware of the railroad history they are interacting with. However, if the Los Gatos Creek Trail county park has done anything, it has reminded people of the captivating qualities that Cats Canyon has to offer. There are still two pullouts accessible to those travelling north on State Route 17. However, for those truly desiring to enjoy Cats Canyon, people should walk the Los Gatos Creek trail through the area. Explorers can either begin from the trailhead on Alma Bridge Road, accessible on the east side of Lexington Reservoir, or from the Forbes Flour Mill Museum, accessible from behind The Pastaria & Market on East Main Street in Los Gatos. For those wishing to walk the right-of-way, remain on the west side of Los Gatos Creek for the duration (the other side of the creek is the old box flume trail). Everything except the final half-mile is the old Southern Pacific Railroad grade. Look for old telephone poles visible along the route, as well as a few culverts and semaphore foundations in the bushes. If you are really up for an adventure, you can also find the old piers to the trestle by going straight rather than up when the trail begins climbing to highway level. Beal, Richard A. Highway 17: The Road to Santa Cruz. Second edition. Aptos, CA: The Pacific Group, 1991. Conaway, Peggy. 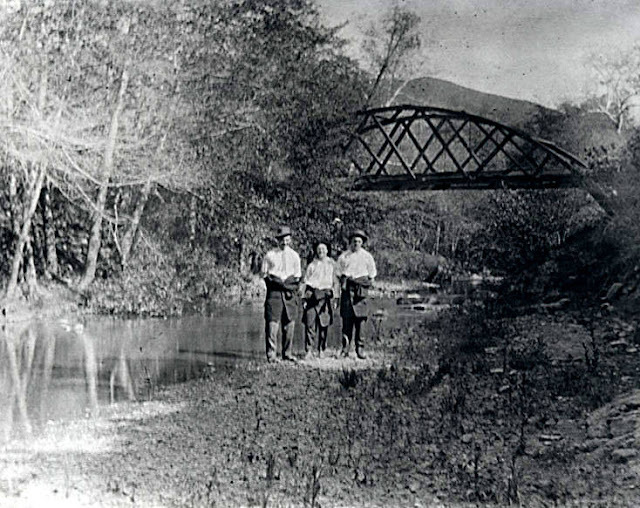 "Los Gatos History Photo: The Old Wooden Flume." San Jose Mercury News, 25 October 2010. Hamman, Rick. California Central Coast Railways. Second edition. Santa Cruz, CA: Otter B Books, 2002. Whaley, Derek R. Santa Cruz Trains: Railroads of the Santa Cruz Mountains. Santa Cruz, CA: 2015. A lot of this country looks very familiar from my bike rides along these route. The rides will be more interesting now that I know a little of the history. Great photos by the way! by then was abandoned. The minute I got on it swaying began and I quickly got off of it! Thank you for photos that tie in with the earliest and fondest memories of my childhood home, Los Gatos. My family lived at several locations: along Summit Road, in Redwood Estates, and, eventually, on Edelen Avenue near University Avenue School. I was an unhappy little boy when Los Gatos Creek was diverted and our swimming hole disappeared.